How To Do Fair Isle On The Loom | Loom Knitting by This Moment is Good! Hello loom knitters and welcome to our color series! This is topic 3, Fair Isle. This is the 3rd in a series of blog posts and accompanying videos discussing different methods of using color in your loom knitting. Check back for future articles or subscribe to our mailing list to be the first notified of the new posts in this series. This post is about Fair Isle loom knitting. Topic 2: How to fix the jog! All the topics will include video links where applicable. Fair Isle is a knitting technique used to incorporate different colors into your knitting. It is named after the Fair Isle which is one of the Shetland islands. It is also referred to a stranded knitting. Using 2 colors makes the fabric thicker, locking in air for extra warmth. No! It's quite easy but does require more time. Placing the colors and managing different strands of yarn require a more organized loom knitter. Other than that, all you need to know is how to read the directions, do the regular knit stitch and lock in your floats. That's it, Fair Isle/stranded colorwork is perfect for the loom as our stitches are well defined and easy to follow. Click here to get this pattern! 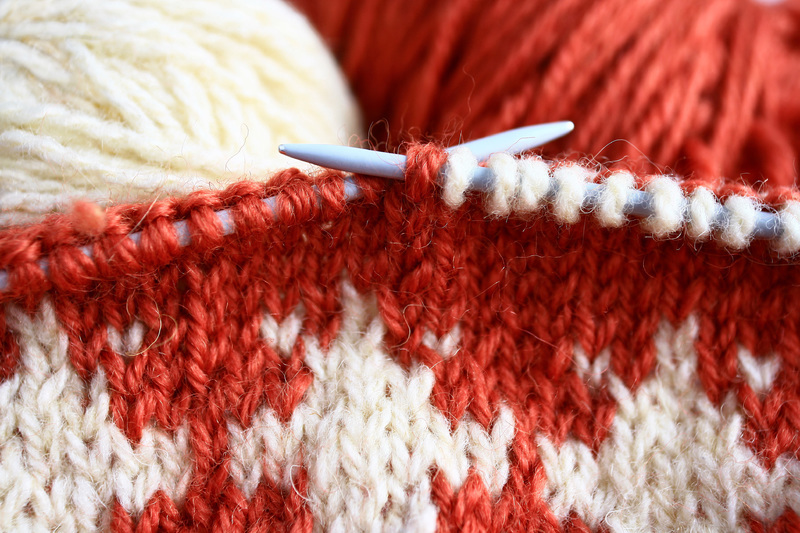 What are the rules of Fair Isle Knitting? No more than 6 or 7 stitches before a color change. Do not float a yarn color for more than 2 to 3 sts on the loom as our gauges tend to be larger and the work can become sloppy/loose with longer floats. 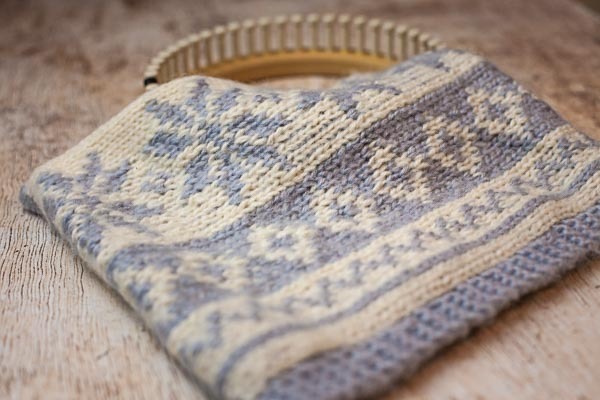 If you know how to do the regular knit stitch then you can do Fair Isle knitting. It's best to use a "sticky" and elastic natural fiber like wool. Wool has barbs on its fibers which will naturally grab onto each other. Use these barbs to your advantage as they will make your fair isle pattern blend nicely. Floats are the long strands created when the non-working yarn is being carried along the back of your knitting. As a rule of thumb, floats should be no longer than 1 inch/2.5 cm. This is hard to gauge on the loom as our pegs are stationary and do not let the knitting shrink until it is far away from the loom. Grinning is when the floats or non-working color yarn shows through to the front of your knitting. Some grinning is to be expected but can be kept to a minimum by carrying your yarn properly and using smaller gauge looms. I always get more grinning when I use large gauge looms as the gaps between knit sts are larger. You can cause grinning by catching your non-working yarn every stitch on a medium to large gauge loom (if you are trying to create flecks of grass, for example). Grinning is explained in the video link below. How do I read the instructions in a Fair Isle Pattern? What does a Fair Isle chart and instructions look like? 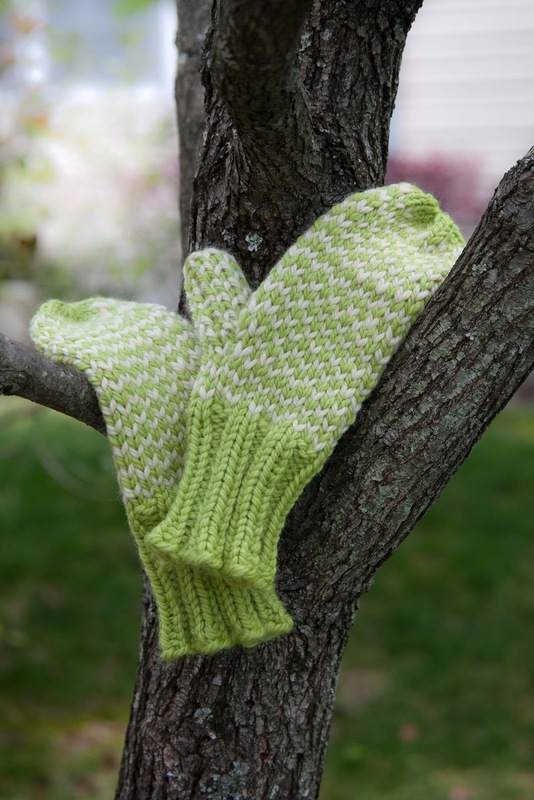 I have a premium loom knitting pattern for free here on the blog. This is a beautiful example of Fair Isle loom knitting. It is both charted and written GET THE PATTERN! Below are the 1st (2) rows/rounds explained on the chart above. All other rows work in the same manner. All Fair Isle charts look similar with different repeating patterns. Round 1: [K1 in A, k2 in B] 16 times (48 sts). This is your 1st round/row: Knit one stitch in color A, Knit 2 stitches in color B, on this chart you will repeat this 16 times until the end of the round. On this row you will not have to carry your yarn because you do not have more than 2 stitches between color changes. Round 2: [K2 in B, [k1 in A, k1 in B] twice] 8 times (48 sts). This is your 2nd round/row: *Knit 2 stitches in color B, [knit 1 stitch in color A, then knit 1 stitch in color B], do the bracketed portion only 2 times. * Repeat from * to * eight times. On stitches 6 through 8 of each repeat, you have 3 sts before a color change. On stitch 8 of the repeat, catch your working yarn to secure it and eliminate a long float. See below for how to do this. Note: Most loom knitters will develop a preference for either written instructions or using the Fair Isle chart only. Both are acceptable, although in needle knitting it is common for there to be only one or the other. My premium patterns are always written and charted so you have a choice. How do I carry my working yarn to eliminate long floats? 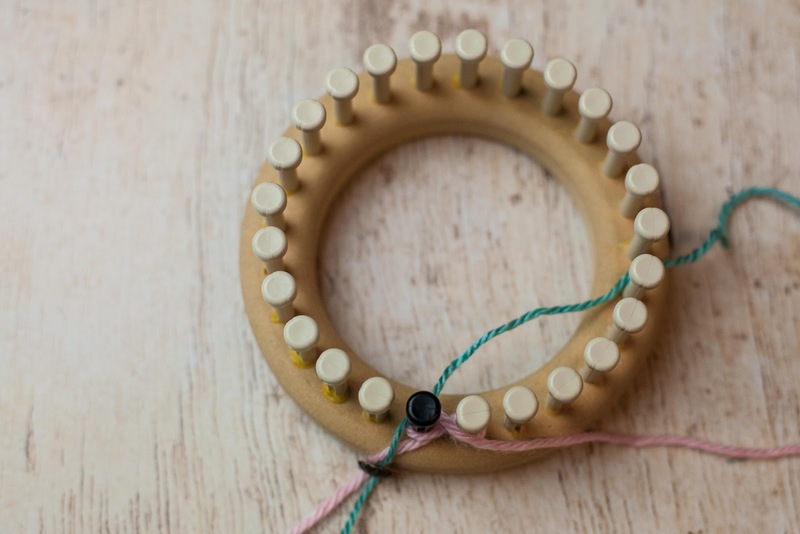 Pull your working yarn towards the center, inside of the loom. Next lay your non-working yarn on top of your working yarn. It should be perpendicular (at a right angle) to your working yarn at this time (picture A). 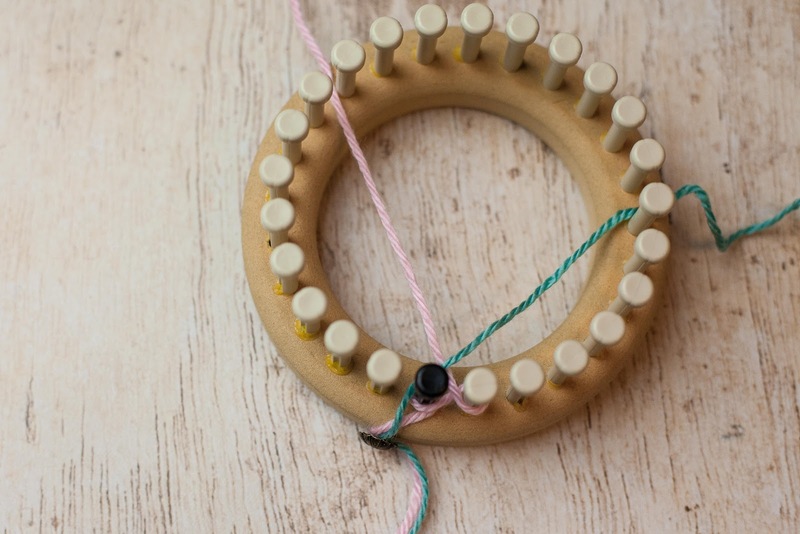 Drop the non-working yarn and knit the next stitch with your working yarn. You'll see that your non-working yarn is "caught" by the working yarn, securing it to the knitted fabric (picture B). This is often referred to as "locking" your float. See pictures below (pictures are for demonstration only, you would be casted on the loom when doing this). Illustration A: The pink yarn is the working yarn and the Aqua yarn is the non-working yarn. Lay your yarn exactly like this to lock in your floats. Illustration B: Non-working yarn is "locked in" behind the peg and the working yarn is brought forward in order to knit the next peg. Which knit stitch should I use to knit Fair Isle/stranded knitting? My preference is to always use the regular knit stitch. Your colorwork will be the most defined and look just like regular needle knitting. The u-knit and flat knit stitch have a lot of tension and make smaller sts than the regular knit stitch. Never use the e-wrap knit as it does not produce stockinette and will not look like Fair Isle. 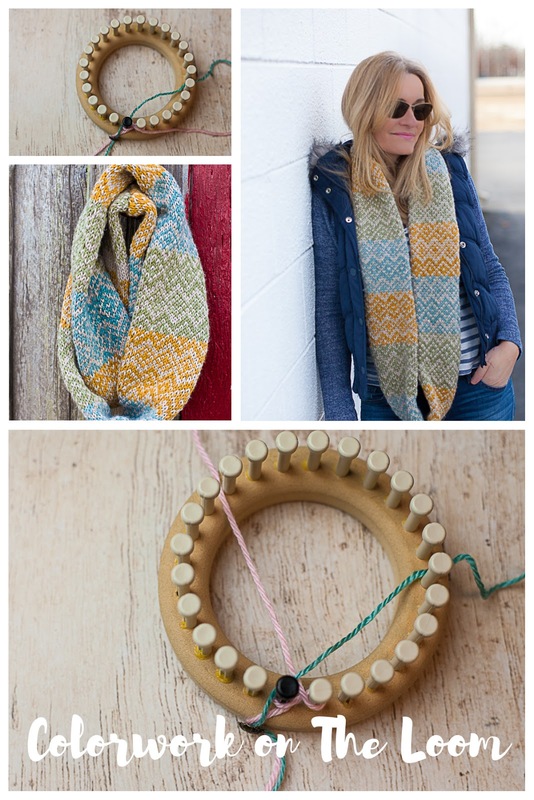 I hope you are enjoying our color series so far and feeling inspired to try these different loom knitting methods. Please leave me any questions in the comments below. have a great day! 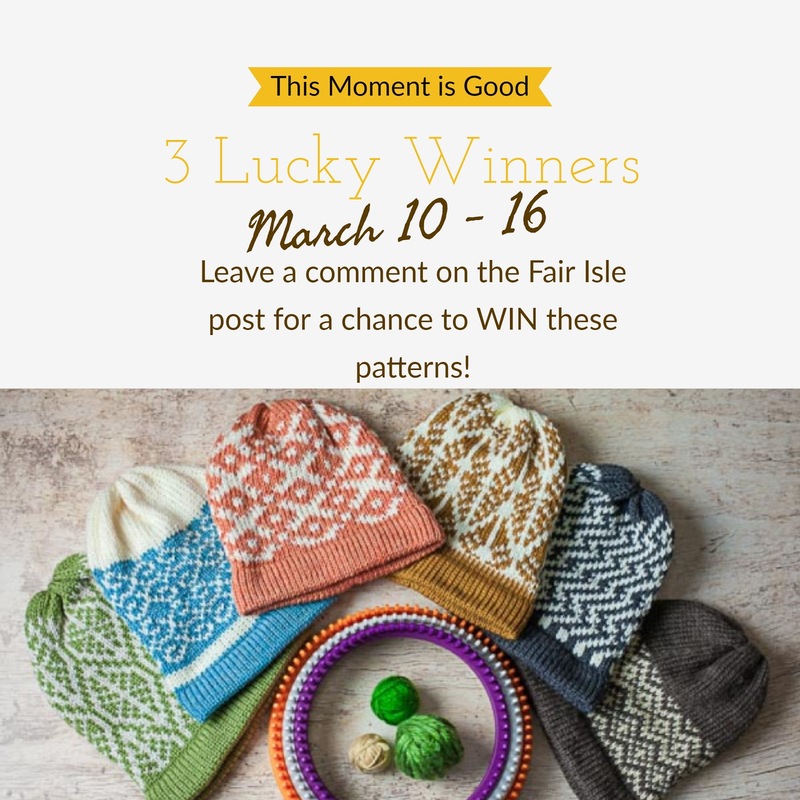 Loom Knitters WIN all (6) Fair Isle Hat Patterns! Or just comment on this post! 3. Comments must be made between March 10 and March 16 to qualify. Comments are moderated for spam so they will not appear immediately. 4. Three Names will be drawn on March 17th, no purchase necessary. 5. Winners will be announced on March 17th here on Facebook and Instagram (so follow us). If your name is announced, you will have one week to contact us at thismomentisgood@comcast.net with the email you would like your patterns sent to. DO NOT leave your email or personal info in the comments section of the blog. The name that will be given in the announcement will be the same name you used to make the comment. 6. You must follow all directions to be entered into the drawing. All of the information has been GREAT. I was tying knots every time I changed colors so learning to lock the yarn has been wonderful for me it looks so much better so thank you. 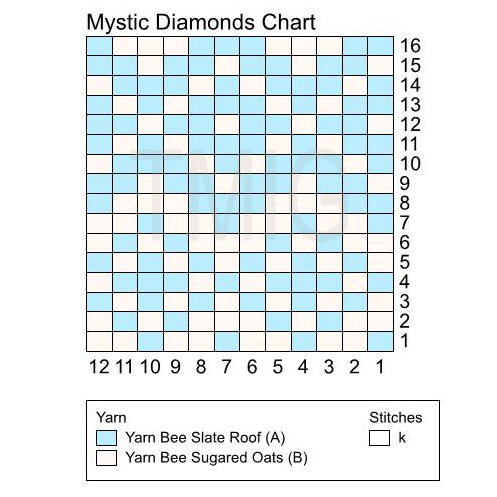 I'm so excited because right now I'm working on my first converted pattern and first wedge pattern and I should be done today and then the most exciting part i get to start the Mystic Diamonds pattern!! I bought yarn for a duplicate color to yours because I LOVE IT! I also bought fall colors. Nicole as I have said before....You ARE AWESOME! Thank you and to others like you for helping and teaching! This technique looks amazing, and I can't wait to give it a try myself! Thank you for this post, I never knew you could do such beautiful things on the loom. Every time I think I could not enjoy you any more than I already do. You come along with something else that I too have been thinking about and longing for. Fair isle is one of my favorite ways to loom knit. Thank you, Nicole, for the wonderful information. I hope more people will try color work! Thank you Nicole, for this wonderful information. You are answering me many questions on how to managing color. Thank you everyone for your nice comments! I'm looking forward to Saturdays drawing for the hat patterns so keep the comments coming to enter. Feel free to let me know other topics you'd like to see on the blog. Have a good week and happy looming/crafting! These are beautiful and your directions are so clear. I'm very new to knitting and the loom but I really want to try something harder so I think this is going to be my next project! I'll probably frog it 800 times but it will be worth it! Oh wow! This is really helpful! I wish I would have seen this before I made a new hat. Guess I will just have to make another one!! Great information! So want to learn how to do this!! Thank you so much for the opportunity. I am beyond grateful. I love love love the colors and the patterns are so unique. So excited to try my hand at this! I typically shy away from colorwork, so this will be a great way to add new skills to my loom knitting arsenal. Who knows, there may be fair isle socks in my future! OOH! 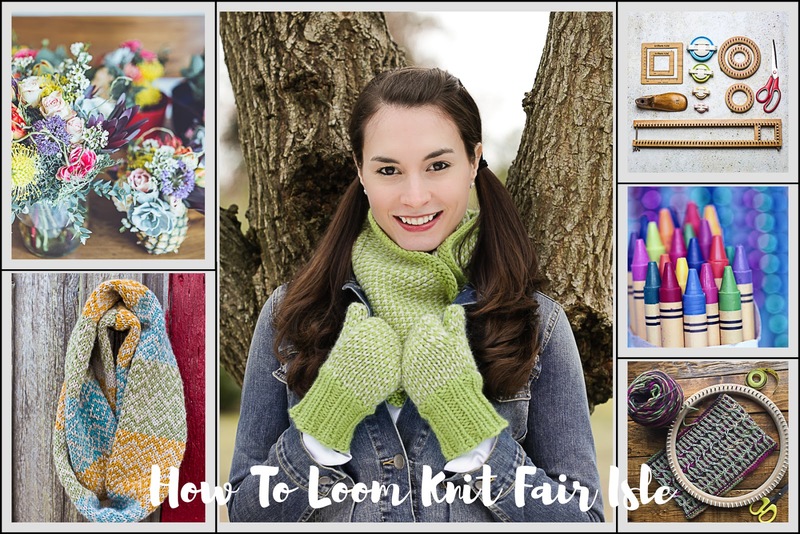 I have been wanting to give fair isle a go and this guide is the PERFECT Start! Love this! Can't wait to try Fair Isle! I have learned so much from you, and I thank you for all the beautiful patterns you have written, and I don’t want to forget to mention to you on how your videos have helped me so much. I love the fair isle scarf. Would the pattern transfer to the addi kingside? Thank you! Do you mean the Addi King size? I don't know much about the Addi machines but I don't think that they are capable of knitting Fair Isle. We are always happy to have a new loom knitter though! Thanks for visiting the blog. The Addi machines are capable of doing Fair Isle, but the number of needles (equal to pegs) that the King has (46) is awkward to pattern around. And it slows things down so much I do it quite seldom. I usually use my Addi when I want to make a simple project quickly. I have been hand and machine knitting for a long time but I am new to loom knitting. I have to thank you for the great blogs, you have cleared up a lot of stuff for me. I wasn't aware that the Addi could do Fair Isle like the regular punch card machines. That's pretty neat if it does it automatically. I can't imagine doing that all by hand on one of those. Yes, I always thought they were for more simple projects otherwise it seems faster to do it on the loom by hand. You are welcome and I hope you continue to visit the blog in the future! PS: The way you get around awkward stitch counts is to add plain borders. If the stitch count is in multiples of 12, you would do 36 stitches in the Fair Isle Pattern and 5 stitches on either side of the Fair Isle in a single border color giving you the 46 sts. This works with any stitch count just divide 46 by the multiple number. Thank u so much after reading this I think I might be able to do it.thank you for all the info!